when you are being SHOT_AT, pistols have NOTHING like the effective range of shotguns, even riot barrels with no choke. Cops these days have many times more handgun training, and the peace of mind of body armor and help available in mere minutes, compared to what it was like in the 70's and earlier. And they STILL miss the entire man with most shots, at a mere 5 yds and mostly miss the vitals at 10 FEET. A shotgun, with buckshot, is a much more reliable hitter, even at 20 yds. but you probably wont have any longarm at hand when you need a gun. On cover using heads, a pistol in average hands and without ear protection, 10 ft is MUCH too far to expect a hit. Platt, in Miami in 1986, had just ONE arm available for using his Mini-14, and he took on 8 feds (with a bullet thru one lung) who had pistols. He killed 2 and wounded 5 more. They missed him over over 30x at less than 5 yds and other than the fluke hit to his arm/lung, only the execution type 3 shots fired into his head/neck at 5 ft( with him bled out, unarmed,) were solid hits. the other 7 hits were peripheral, some of them being buckshot pellets to his feet, fired under the car he was using for cover. He'd painted the side of his monte carlo with his blood, using it for cover. 8 to 1 odds, with ONE arm and he damned near killed them all. The guy who hit his arm/lung missed him 14 more times, from about 10 yds. the distance was the only thing that saved that Fed. had platt had ear protection, both arms and an AK, with steel cored bullets, he'd have killed them all and gotten away. If he'd had sense enough to stop the car when the cops first spotted him, he and his buddy would only have had to kill 2 cops to be free to drive off, nobody following/calling about them. anyone with sense would use a mini-van for robberies, with a pair of off road motorcycles and BOB's in the back of the van. Put on a helmet and face mask and nobody can tell who you are, bikes can go against traffic easily, losing any 4 wheeled pursuit.. Have a change of clothes, get off the bike and you are just another guy on the street, 2 miles away from the shootout, 4 minutes later. those 2 idiots were killing people (out plinking) to get an "untracable' vehicle. well, one guy survived, told the cops and they were LOOKiNG for that monte-carlo! dummies. If all you want is a vehicle, all you have to do is look under a dozen of them for a magnetic hideakey box. You'll find one! they didn't even have sense enough to have hearing protection or soft armor, ferchrissakes, and Matix got hit after he fired ONE rd. So all the fighting was Platt, with just one mag of 223 (once he got out of the car. He'd emptied another mag thru the back window as they tried to drive off, but the 223's broke up on the windshields, and he hit no cops with that magful of 223). The thing to have done would be to stop. both guys have AKs (dummy Matix had a 12 ga with #6 birdshot, ferchrissakes!) use the engine block as cover and shot the feds car full of steel-cored .30 ak ammo. then drive off and get on the bikes. A cargo van is easily 'armored' vs 223, pistol rds or shotgun slugs or buckshot. All it takes is 1/4" steel plate on the rear doors and backs of the front seats, along with gravel behind plywood on the sides You only need 3 ft high, at most, cause you'll be crouching! when you separate, it gets twice as hard to find you both, but me, I'd shoot my partner, so he could never talk. cause he's almost certain to get caught. Real deal operators are like one in a million men. and one in 100 million robber types. I hiked cross country many moons ago in a country faraway from here. I had a cz100 iwb and 2 spare mags. I hitched rides ( this was definitely not a safe practice, but I had a timeline) and even hitched a ride with an off duty cop! Wasn't found out once. It was borderline chaos in the country and just about everyone carried a firearm, but I can tell you that if I tramped around with a sling rifle, I would have been taken out by cops or thugs welding Al's as soon as they spotted me. If I knew I was going to bug out, I'd probably pack an AR pistol, in a pack. I have such a beast in 9mm that uses the same mags as my carry gun - g19. Throw in a few spare 30 round mags with hit loaded ammo and you are good to go. A well placed 9mm will take a 150 lbs antelope down. Seen it myself at 50 odd meters with bog standard 124gr NATO. Just noticed autocorrect fuxked me a few times in the post above! I don't know how to edit from phone! I should point out that I posted in this particular category for a simple reason. This is the initial prepping section. For those just getting started it's a lot cheaper and in many cases easier to start with a pistol. It's not the perfect plan for everyone but it's a good initial plan. corrsk wrote: I should point out that I posted in this particular category for a simple reason. This is the initial prepping section. For those just getting started it's a lot cheaper and in many cases easier to start with a pistol. It's not the perfect plan for everyone but it's a good initial plan. I think initially, a handgun for any first time gun owner, prepping or not, is a better purchase as opposed to a rifle. It doesn't require such a large investment is gear, ammo, space, accessories, etc. And it generally can do anything that a firearm is needed in 95% of situations. If I'm bugging out I have a wife and a 7 year old son. Corrsk jr won't be hauling much because of his size and age. So the wife and I are going to have to make up for that. Ditching the rifle means I can haul for food and water for the little guy. Do not count your young son out. Outdoor Products makes excellent daypacks, available at Walmart. Mine have been doing double duty as the kid's school bag and day pack for hiking or Cub Scout outings. They even have a sleeve for a bladder. In a bugout he can take his own fleece, rain jacket, some food and a couple of changes of socks and a favorite comfort toy. delarey wrote: I hiked cross country many moons ago in a country faraway from here. Agreed, I originally got my AR pistol as a range fun gun, with a very slight thought on the advantages the pistol classification brings to it, my last hooray before our first child is born and fun money gets cranked down. But the more I work with it, the more I'm finding advantages with the size and setup. Unfortunately I can't fit it into my EDC pack (which is my GHB) assembled, but it fits no issue broken down. This gives you options. But my double stack 9mm is still far more likely to be my "primary" as I am already carrying it everyday and everywhere it's legal. Edit: This is a 10.5" AR pistol with carbine length gas, not one of those pistol gassed 7.5"
tonydedo25 wrote: Most of your logic is sound. Most intelligent thought on the subject concludes that a pistol is superior to a rifle in home defense and bug out scenarios because it's concealable, portable, maneuverable and can be operated one handed. Most of the reasons that are commonly cited for choosing a rifle (range and accuracy) are immature and fanciful. There is no legal justification to be taking 100+ yard precision shots in any remotely realistic defensive scenario. However, I'd seriously reconsider any notions of relying on hunting into your survival/bug out plan. Unless you're a skilled and seasoned hunter in a very remote and well stocked area, it's just not realistically feasible. The VAST majority of recreational or inexperienced hunters don't have the skillset required to sustain themselves by hunting, and the vast majority of the US doesn't have the wildlife stocks to support sustained hunting. Unless it's something that you already do and rely on regularly, don't plan on relying on it when SHTF. Forget the 10mm and the 22LR, just buy a good reliable pistol in a defensive caliber (9mm) and learn how to shoot it well. Depends how picky you are. Start eating dogs segulls and stuff. you will have more opportunities. Pistol primary, plus a matching pistol caliber carbine in the pack (sub2k is perfect for this) as backup? If you need to engage a threat NOW, a CCW draw is perfect. If the threat is at rifle range... finding cover and drawing the PCC is an effective solution. Really, a rifle range threat should be engaged by withdrawing, not trying to battle it out, if you're in a mostly peaceful bugout. 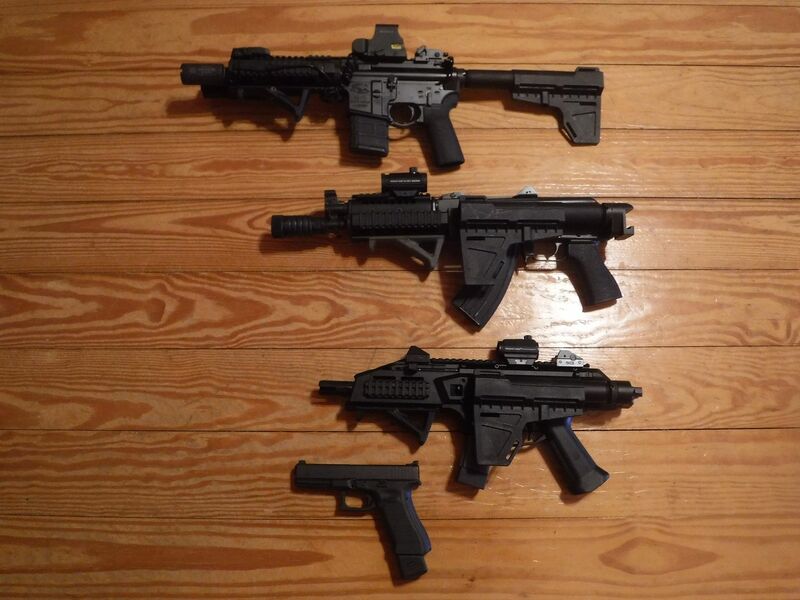 .milFox wrote: Pistol primary, plus a matching pistol caliber carbine in the pack (sub2k is perfect for this) as backup? That is the truth of it. If you are working with a rifle range target, get away before thinking of engaging it. If you have to engage it, I'd suggest looking at what a 9mm can do at 100 and 200 yards. You'd be surprised at what a 9mm pistol can do when you know what your holdovers are. In the very unlikely event that my family has to bug out, I'd have a total of 6 shooters. Me, the wife, dad, mom and 2 kids. My sister is a fragile creature, so I won't ask her to take a life...But she can rock a BRNO .22 rifle like few. Saw her shoot a rabbit in the eye at 50m. I've really been pleased with ATI's AR15 9mm pistol that takes Glock mags. None of these replace a CCW, but for compact, discreet carry, these all are vastly superior to a CCW handgun out to 100-150 meters. Yes, I have a couple "compact" rifles (JRC Take-Down, SUB2K and folding stock AK), however, some locations are more strict about carrying a rifle in your vehicle over a pistol. I concede these aren't for everyone or every situation, but I've found them quite ideal for my current situation. Ohhhh the ATI is interesting. Is it a polymer lower? delarey wrote: Ohhhh the ATI is interesting. Is it a polymer lower? Never saw one in the wild, but I'm pretty sure this ATI is aluminum. 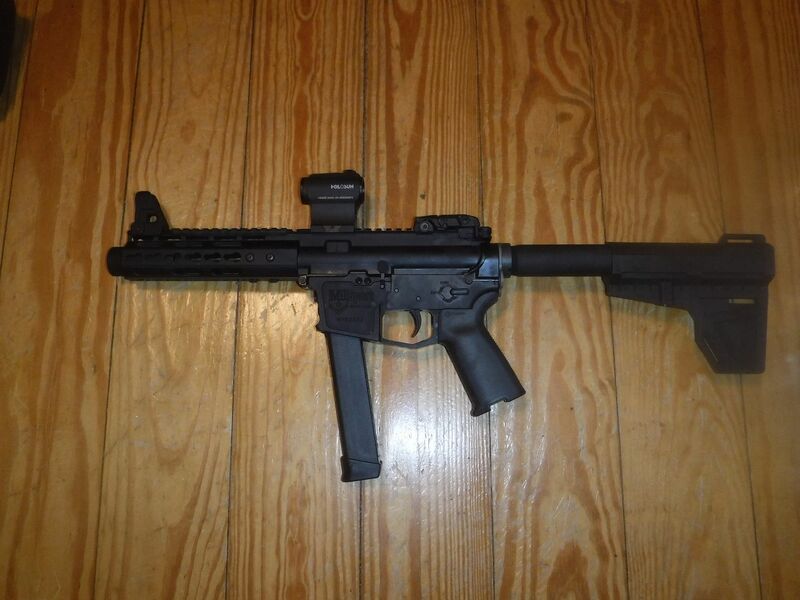 I read a review a few months back that loved this 9mm carbine/pistol. Thanks...ATI has good prices normally. As mentioned, it's an aluminum lower. Other than the no-bolt-hold-open on an empty magazine, it's been flawless; excellent "pistol". Thanks for the update. A lot of companies are getting into the ar9 game. Saw a spikes ar9 the other day. I agree with this thread. Pistol should not replace rifle, but when mobile, pistol is best option. Try hunting for deer or hogs with that 10MM Glock and get back to me about how well it works as a hunting tool. I hope your stalking technique allows you to get within 25 yards. The idea of pistol as primary depends a lot on your likely environment, doesn't it? In a big city like NYC, with high crime areas, odds of needing a firearm are increased if your route requires passing through such an area. Some of the small towns upstate near the city aren't a lot better. Last time I went to Cincinnati I recall your state being somewhat urbanized, but not as bad as southern NY. I don't recall air rifles having all that much range compared to a .22LR. I've hunted white tail and boar quite successfully with both my Glock 20 and EAA Witness Hunter I borrowed from a friend (the EAA had top rails for optics). I have also dealt with feral hogs with a .357 revolver. That said in my area most encounters tend to be less than 50 yards. There were no complaints after the encounters. There is an old saying ...When you need a pistol a carbine is too long. When you need a rifle a carbine is too short. When you do not know if you will need a pistol or a rifle; you need a carbine. That is why I now use a Rossi 92 (16 inch BBL) in .357 for my woods/marsh firearm. What ammo have you found to work well? Brand? Grains? The feral hogs in my area tend to be smaller due to active hunting of them. They are typically young at 100 to maybe 250 lbs. I initially used Speer 158 gr gold dot which worked well as long as I did my job. They over penetrated on the smaller ones but were ok but not stellar on the bigger ones. I still use these in the 4 inch barreled revolver I carry for this purpose. I want the penetration from this round if i have to use the revolver. I switched to the Rossi and I tried the Hornady LeverRevolution 140 grain but I was not pleased with the accuracy of the round in this rifle. (My problem not the rifle, YMMV) The projectile also seemed to not hold up as well (opinion not fact here) inside the target. I switched to Buffalo Bore 180 gr which works very well. It does not foul the barrel, the hard cast lead does expand and the heavy weight slug generally drops the critter DRT assuming I do my job. There are also fewer instance of over penetration when engaged broadside and angular engagements are far more reliable with the heavy slower slug than the other two. Bear in mind all of my engagements are less than 100 yards and typically 25 to 50 yards. Some are at "how do you do" range.